(1). This product has unique structure and novel style. (2). Brushless motor fan, long life of wind. (3). Intelligent control,simple operation, stable and reliable performance. (4). 18650 lithium battery, versatility, can be recycled, low cost. (5). Integrated design, simple appearance, solid structure, easy to carry. 【Super Quiet & Strong Wind】: It is a unique innovation design with 15-degree diagonal fan blades, cutting airflow is uniform and dense; strong wind concentration is followed. The sound is as low as 40 db and will not interfere with the rest of the family, colleagues or roommates. 【Clip-On & Desktop】: The clip is padded, to prevent the desk and furniture to be damaged, the base is balanced, just set it on the desk without clip. It can be put or clip on anywhere you want, and great for baby stroller, car,office,bedroom,camping,traveling. 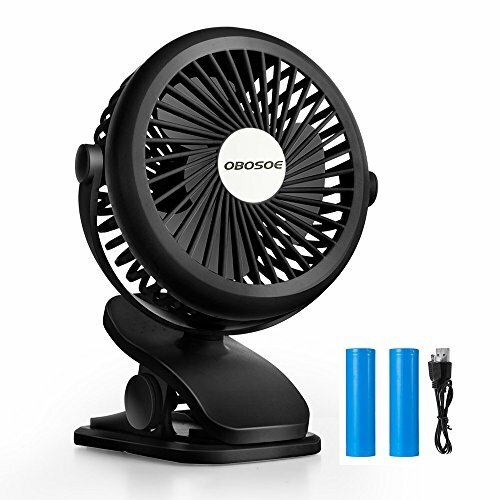 【Mini&360 Degree Rotation】: Portable design , small(5.90*3.93*7.48 inch) and lightweight(9.87 ounces), suitable for outdoor and indoor use.The arm can be swiveled as well as the fan, The fan can be rotated into just about any position you want it to be in. 【Come with 2 Batteries& 3-Speed】: Replaceable and Rechargeable large-capacity battery(2pcs), USB powered and charging, charging time only takes 2 hours and standby time is up to 7.5 hours.The air volume can be adjusted according to your needs between low, medium and high 3 speeds. 【12 Month Manufacturers Warranty】: OBOSOE offers one year warranty against defects,If you have any performance issues, please free contact us and we will do whatever it takes to ensure your complete satisfaction. View More In Personal Fans. If you have any questions about this product by OBOSOE, contact us by completing and submitting the form below. If you are looking for a specif part number, please include it with your message.